Signature HealthCARE’s rehabilitation team is dedicated to providing top rehabilitative care to residents of Signature HealthCARE communities nationwide, as well as other individuals on an outpatient basis. 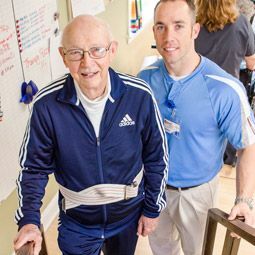 Under Signature Rehab’s integrated care model, rehabilitative therapists work closely with other clinical caregivers seeking to ensure residents and patients make a full recovery and a timely return to the activities they enjoy. Clinical teams work together to develop and implement rehab programs that best complement individual facilities and patient populations.